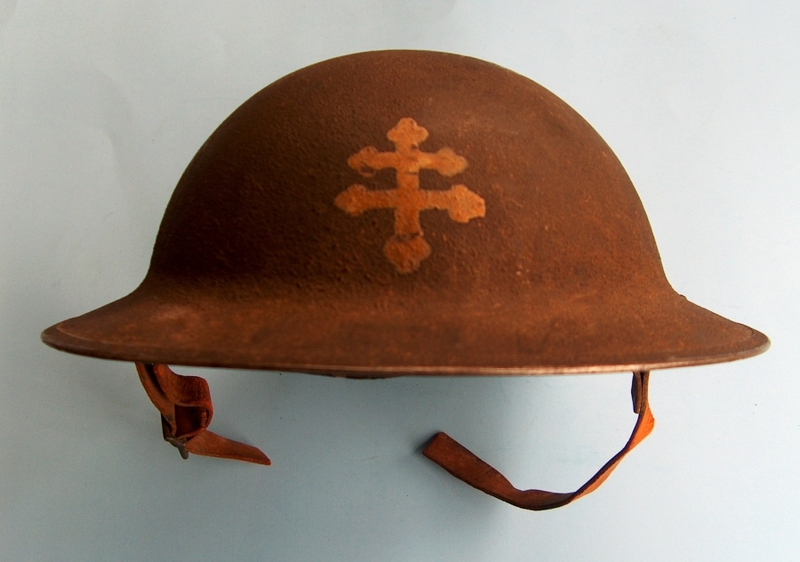 The insignia of the 79th Division is the Cross of Lorraine, a symbol of triumph dating back to the victory of the House of Anjou over Charles the Bold, Duke of Burgundy, in the 15th century. During the fall of 1918, General Headquarters of the American Expeditionary Forces spent much time in studying the question of the identification of troops in battle and of assembling them during the heat of action with its attendant confusion and dispersal of units. The idea of selecting distinctive insignia for each division, with the insignia to be worn by each member of the division on the upper left arm near the shoulder was proposed and immediately acted upon. The commanding generals of all combat divisions were ordered to select insignia for their divisions and to submit their selection for approval to General Headquarters. One by one, the combat divisions adopted their insignia. Following official approval and enactment, the idea proved to be so successful and of such an assistance in stimulating the morale of the troops that it was later extended to include all organizations in the American Expeditionary Forces. The official insignia for the Seventy-Ninth division was selected and approved shortly after the signing of the armistice, while the 315th Infantry still held its position in the shell-torn villages of Etraye and Damvillers northeast of Verdun. The insignia proposed by Major General Joseph E. Kuhn as best symbolizing the history and spirit of the Seventy-Ninth Division, was the Lorraine Cross. The Lorraine Cross is an ancient emblem of victory, adopted in the 15th century by the House of Anjou as a symbol of triumph following the defeat of Charles the Bold, Duke of Burgundy, in the Battle of Nancy. For over five hundred years the double traverse Cross of Lorraine had served as an emblem of victory and freedom for the brave, liberty-loving people of Lorraine, and certainly no other emblem could have better represented the history and traditions of the 79th Division. 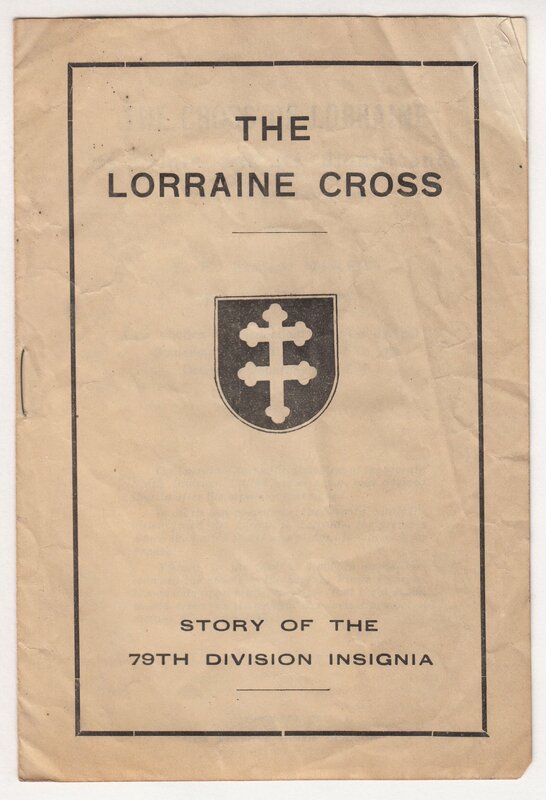 The historical background for the adoption of the Lorraine Cross as the official emblem for the 79th Division rests in the fact that during its period of training in America the division was popularly known as the "Liberty Division." 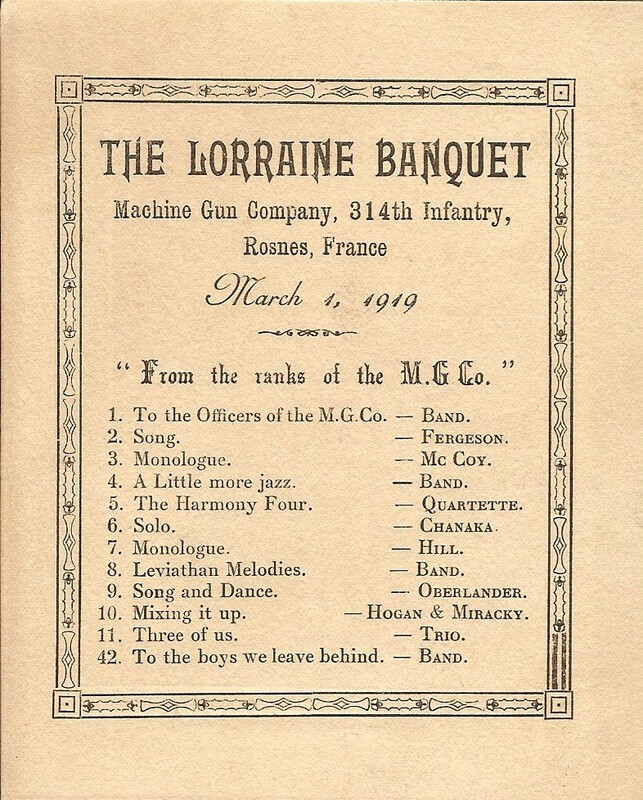 In addition, during all its operations in World War I the Division faced the enemy in Lorraine, the province which the United States was pledged to win back in its entirety for France. 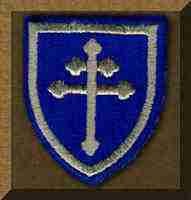 The insignia of the Seventy-Ninth Division, as officially adopted, consists of a gray Lorraine Cross on a blue shield with a gray border. In the passing of time, a slight modification was made to the insignia as worn by officers in which the Lorraine Cross was done in silver thread with a silver border for the shield. In its hues of silver, gray and blue, the insignia of the Seventy-Ninth Division has become dear to the hearts of thousands of the best of America.s citizen soldiers. Grateful acknowledgment: I am indebted to www.tech-writer.net for the information above, circa 2008, alas, that website no longer appears. 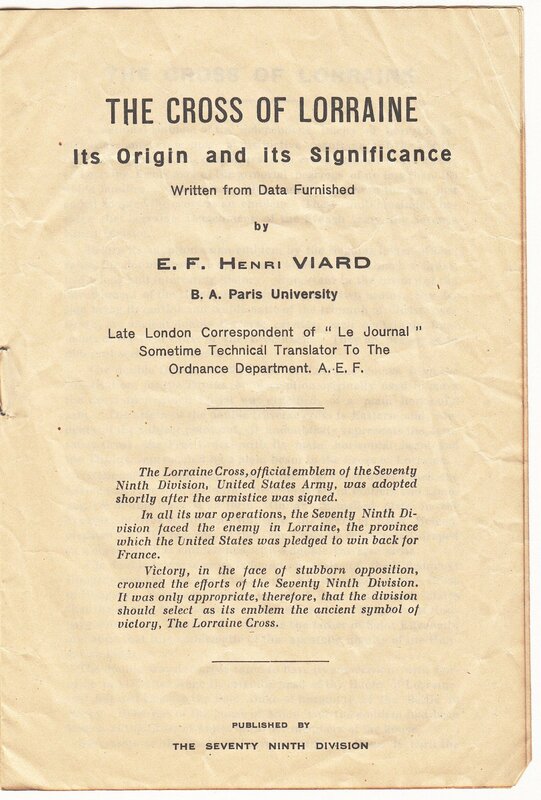 Late London Correspondent of "Le Journal"
Sometime Technicd1 Translator To The Ordnance Department. A. E. F.
The Lorraine Cross, official emblem of the Seventy Ninth Division, United States Army, was adopted shortly after the armistice was signed. In all its war operations, the Seventy Ninth Di-vision faced the enemy in Lorraine, the province which the United States was pledged to win back for France. Victory, in the face of stubborn opposition, crowned the efforts of the Seventy Ninth Division. It was only appropriate, therefore, that the division should select as its emblem the ancient symbol of victory, The Lorraine Cross. A national emblem of the independent Duchy of Lorraine for centuries, and even now a distinctive cognizance of the Border Province of France, the double traverse cross, known as the Cross of Lorraine, forms part of the armorial bearings of no less than 163 noble families. And several military units engaged in the war just ended adopted the cross as an emblem. These units include, besides the Lorraine Detachment of the French Army, the Seventy Ninth Division. 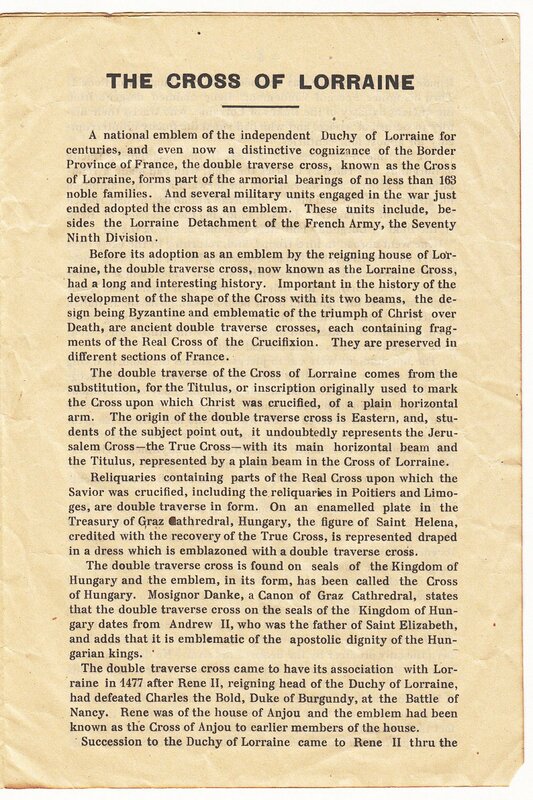 Before its adoption as an emblem by the reigning house of Lorraine, the double traverse cross, now known as the Lorraine Cross, had a long and interesting history. Important in the history of the development of the shape of the Cross with its two beams, the design being Byzantine and emblematic of the triumph of Christ over Death, are ancient double traverse crosses, each containing fragments of the Real Cross of the Crucifixion. They are preserved in different sections of France. The double traverse of the Cross of Lorraine comes from the substitution, for the Titulus, or inscription originally used to mark the Cross upon which Christ was crucified, of a plain horizontal arm. The origin of the double traverse cross is Eastern, and, students of the subject point out, it undoubtedly represents the Jerusalem Cross - the True Cross - with its main horizontal beam and the Titulus, represented by a plain beam in the Cross of Lorraine. Reliquaries containing parts of the Real Cross upon which the Savior was crucified, including the reliquaries in Poitiers and Limoges, are double traverse in form. On an enameled plate in the Treasury of Graz cathedral, Hungary, the figure of Saint Helena, credited with the recovery of the True Cross, is represented draped in a dress which is emblazoned with a double traverse cross. The double traverse cross is found on seals of the Kingdom of Hungary and the emblem, in its form, has been called the Cross of Hungary. Monsignor Danke, a Canon of Graz Cathedral, states that the double traverse cross on the seals of the Kingdom of Hungary dates from Andrew II, who was the father of Saint Elizabeth, and adds that it is emblematic of the apostolic dignity of the Hungarian kings. The double traverse cross came to have its association with Lorraine in 1477 after Rene II, reigning head of the Duchy of Lorraine, had defeated Charles the Bold, Duke of Burgundy, at the Battle of Nancy. Rene was of the house of Anjou and the emblem had been known as the Cross of Anjou to earlier members of the house. Succession to the Duchy of Lorraine came to Rene II thru the female line. His mother was Yolande of Anjou, daughter of Rene I. Thru his father, Ferri of Vaudemont, Rene claimed descent from the Ancient dynasty of the Dukes of Lorraine, who traced their history to Gerard of Alsace, and who had ruled the Duchy uninterruptedly for almost four centuries. At the time of the accession of Rene H, the neighboring Duchy of Burgundy was ruled by Charles the Bold, who had made a reputation as a general and warrior. In the forwarding of his ambition for greater territory and more widespread authority, he had roused the enmity of Lorrainers. In 1476, following the accession of Rene II, the Duke of Burgundy laid siege to Nancy and took the city. Rene went abroad to hire troops, and, returning in the early days of 1477 with considerable forces, especially Italian and Swiss mercenaries, gave battle to Charles within sight of Nancy, whose soldier citizens sallied forth to his help. Despite their assistance, Rene might have lost the fight had it not been for Campo Basso, an Italian condettiere in the service of Charles the Bold who, having some grudge against the latter and being bribed by the other side, went over to the Lorrainers at the critical moment. The Burgundians were cut to pieces. Charles the Bold, in trying to break away, was slain by a Lorraine officer who did not recognize him and who committed suicide when, the body of the famous Duke having been identified a couple of days later from an old scar behind the ear, he realized that it was he who had killed "so great a Prince." It might seem strange that the body of the Duke of Burgundy should have remained unidentified for anytime. The explanation is that the Swiss and Italian mercenaries and, indeed, the Lorrainers, were out for booty. The duke's rich accoutrements were a tempting loot. The battle of Nancy was not only the greatest event in the history of Lorraine, but one of the most momentous in the History of France and even of Europe, although, perhaps, the whole scope of its effects has not been brought out adequately by historians. If Burgundy alone was defeated, three parties benefited by the victory, namely: Switzerland, for whom it meant final acquisition of independence; the King of France, and the Duke of Lorraine. The disappearance of Charles The Bold ensured at one stroke the Unity of France, which it rid of the last ever powerful vassal, and the independence of Lorraine. No doubt Louis XI would rather have been the only profiteer by the death of his rival. No doubt, also, he meant to get hold of Lorraine and, as the event proved, laid hands shortly afterwards on the Duchy of Bar and tried to prevent Rene II from coming into this comparatively small portion of Rene of Anjou's inheritance. But his wily plans were foiled by the very fact that, whatever his motives, he had made a show of fostering and supporting the Lorrainer against the Burgundian. Had Lorraine become a part of Charles the Bold's dominions, even the Mighty House of Austria would have been unable to keep it independent from France; Henry ll's efforts would have been exerted against Lorraine, and Lorraine it is that France would have occupied at the same time as the three bishoprics, Toul, Metz, and Verdun and before Alsace. France's influence made itself felt in the Duchy as early as 1552, but annexation was put off until 1766. Not only did Rene II's reign ensure the independence of Lorraine, but it secured the adjunction of Barrois, for there can be no doubt that the Duchy of Bar would have been annexed to France right away had not Charles VIII found it politic to give back the territory confiscated by his father Louis XI as an inducement to Duke Rene II not to press his claims regarding such parts of Rene of Aujou's inheritance as Anjou and Provence which France wanted and secured out of the deal. Considering the importance of the Battle of Nancy in the eyes of Lorrainers, the historical value of the badge worn by their victorious ancestors at that famous fight is easily understood. That badge was a double traverse cross. We have Duke Rene II's own word for it. In the account of operation and conduct of the battle of Nancy, dictated by the Duke himself to his secretary Joannes Lud, we read: "And I had on my harness a robe of gold cloth, and the armour of my horse was also covered with gold cloth trappings and on the said robe and trappings were three white double traverse crosses." The reason why Rene II adopted the badge is apparent from what has been said in previous pages. The Burgundian badge was the St. Andrew Cross. To differentiate his men from their opponents, Rene II naturally thought of the conspicuously distinct double-traverse cross his grandfather Rene I had brought over from Anjou and made so much of. 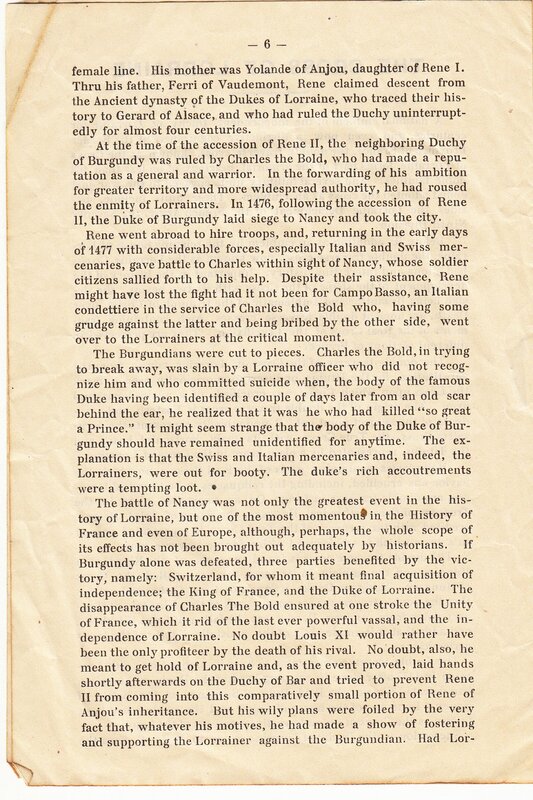 In another account of the battle, to be found in the Chronicle of Lorraine, written at very nearly the same time, the following passage occurs relating to the period of the fight when Campo Basso and his mercenaries went over from the Burgundian to the Lorrainer side. "They all tore off their St. Andrew crosses and put on the Jerusalem one, which Duke Rene was wearing." The Jerusalem Cross obviously is a misnomer, as proven by the context the very next sentence of which reads: "And many of the Nanceians, sallying from their city to take part in the pillage of the Bold One's Camp, were in great danger of being slaughtered by the Swiss and by their own Countrymen because they had not the double traverse cross on them." 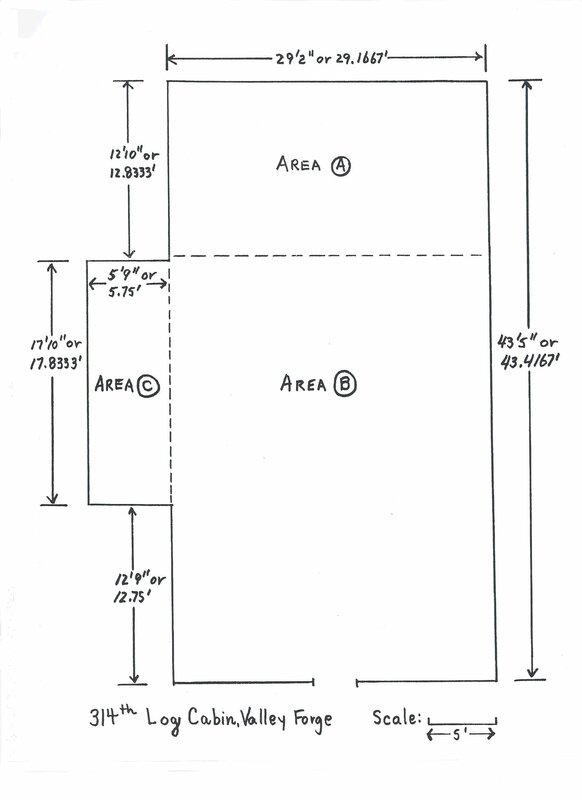 Again in several other passages the cross is specifically described as a double traverse cross. Curiously enough, the misnomer has not been made out by many of the writers and artists who have described or depicted the battle where Charles the Bold met his fate. In Mr. Pfister's exhaustive history of Nancy, for instance, a plate is reproduced from the Nanceid, an epic on the subject of the great fight, and on that plate Rene II is portrayed wearing a number of Jerusalem crosses on his robes and horse trappings. 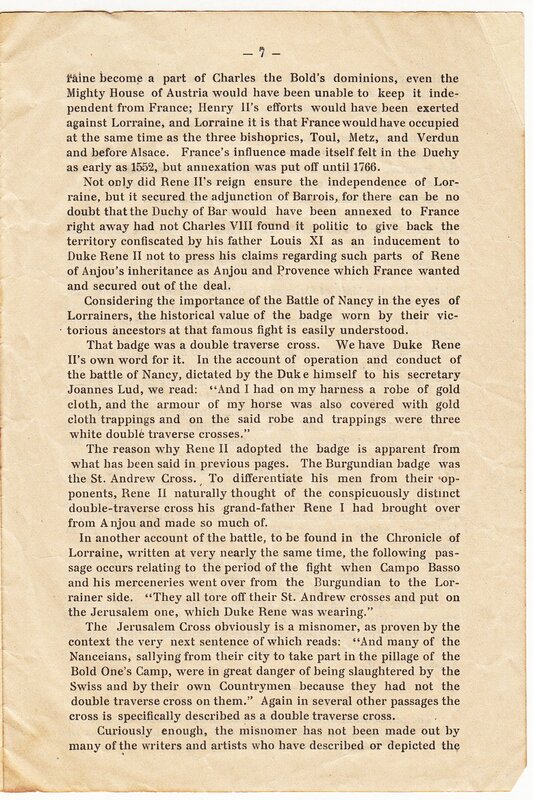 The two above quoted documents, the Duke's own statement and the iterative mention in the Chronicle of Lorraine put it beyond question that the crosses worn by Rene II and his men were the double traverse cross he had got from his grandfather. January 5, 1477, was the birthday of the Cross of Lorraine. From that day, ceasing to be merely reminiscent of Anjou, the double traverse cross became the Lorraine National Emblem. Joan of Arc, the "Good Lorrainer," as Villon calls her, is commonly represented with the Lorraine Cross emblazoned on her breast plate. But the Maid of Orleans lived from 1412 to 1431, and the Anjou double traverse cross was brought to Lorraine by Rene I only in 1435. It never was a Lorraine badge until 1477, when Rene II originated it as such at the battle of Nancy. For sake of accuracy it may be mentioned here that it has been contended that Joan of Arc was not a Lorrainer, her birth place belonging to Champagne at the time. 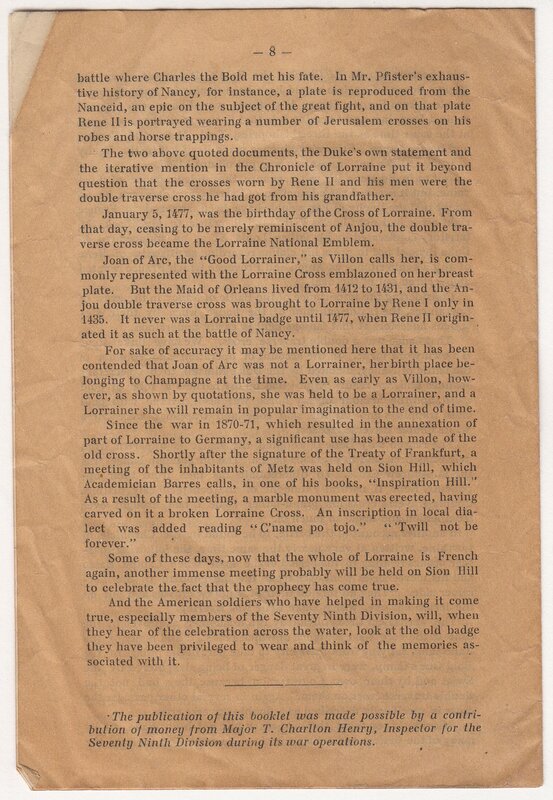 Even as early as Villon, however, as shown by quotations, she was held to be a Lorrainer, and a Lorrainer she will remain in popular imagination to the end of time. Since the war in 1870-71, which resulted in the annexation of part of Lorraine to Germany, a significant use has been made of the old cross. Shortly after the signature of the Treaty of Frankfurt, a meeting of the inhabitants of Metz was held on Sion Hill, which Academician Barres calls, in one of his books, "Inspiration Hill." As a result of the meeting, a marble monument was erected, having carved on it a broken Lorraine Cross. An inscription in local dialect was added reading " C'name po tojo." "'Twill not be forever." Some of these days, now that the whole of Lorraine is French again, another immense meeting probably will be held on Sion Hill to celebrate the fact that the prophecy has come true. And the American soldiers who have helped in making it come true, especially members of the Seventy Ninth Division, will, when they hear of the celebration across the water, look at the old badge they have been privileged to wear and think of the memories associated with it. 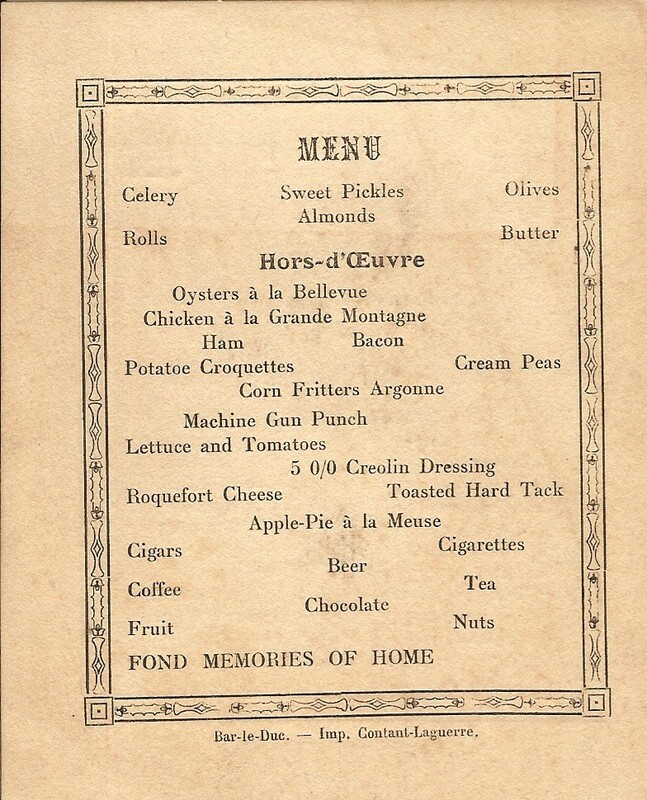 The publication of this booklet was made possible by a contribution of money from Major T. Charlton Henry, Inspector for the Severity Ninth Division during its war operations. Movie Database: released 12 November 1943: A group of French soldiers during WWII are captured by Nazis troops and sent to a military prison. There they will have to make use of his best resources to keep alive... and sane, while at the same time scheming a way out.